AMSTERDAM, WILLEMSTAD - As of the 2017 winter season, KLM flies to Sint-Maarten twice, instead of four times a week. It is not a direct flight, but with a stopover in Curaçao. This new schedule will start on October 29, 2017. Currently, KLM flies to Curaçao with a Boeing 747 weekly. From November 15, another direct flight with an Airbus A330 will be added. Two additional weekly flights will be available from mid-December to late February 2018, during which 12 flights will be flown to Curaçao. The airline flies twice a week from Curaçao to Sint Maarten. This is half of the current number of flights. An extra flight is also available to Bonaire and Aruba during the winter season. With an Airbus A330 KLM flies to these islands seven times a week, instead of the current six flights. 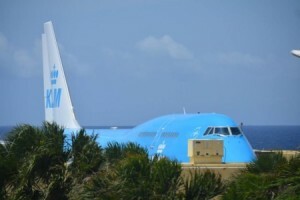 TUI has stopped all flights to St Maarten for the summer season. The travel agency will continue to fly to the island until the end of October, after which they will switch to KLM flights.